Devils @ Cradle Wildlife Park Tasmania, Cradle Mountain Tours. An exclusive evening visit to the sanctuary, experience amazing animal encounters. 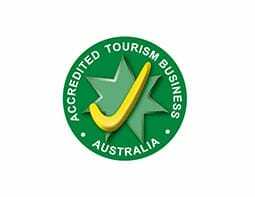 A world class wildlife conservation facility at Tasmania’s premier wilderness destination. The spectacular and pristine wilderness of Cradle Mountain is home to the mysterious and secretive Tasmanian Devil. Devils @ Cradle is a unique Tasmanian conservation sanctuary located at the entrance to the spectacular World Heritage listed Cradle Mountain National Park. 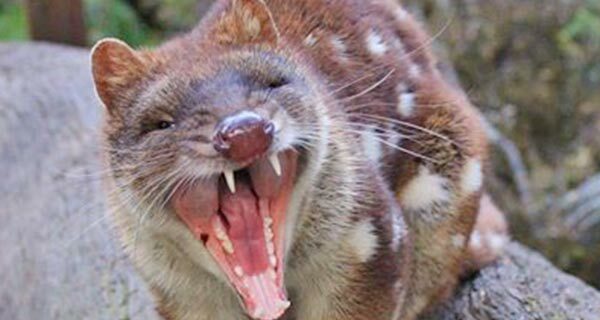 Whilst we concentrate primarily on the Tasmanian devil, the sanctuary is also home to the closely related Spotted-tail and Eastern quolls. 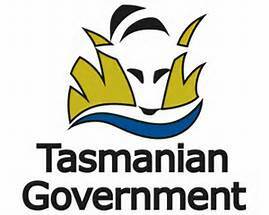 Tasmania’s three largest carnivorous marsupials are all now threatened in one way or another in the wild. Visitors to the sanctuary can view these animals from the comfort of the visitor centre, wander through the sanctuary at their leisure, or join a personalised guided tour which ensures a close up encounter with our animals. 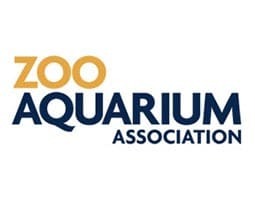 Your visit will provide an insight into the daily operation of a working conservation facility for one of the world’s iconic animals, knowing your ticket fee is contributing to our conservation of these species. Open DAY and NIGHT every day, we offer a range of experiences, from General Entry and DAY KEEPER tours through the day, to our AFTER DARK FEEDING and DINE WITH THE DEVIL tours in the evening. 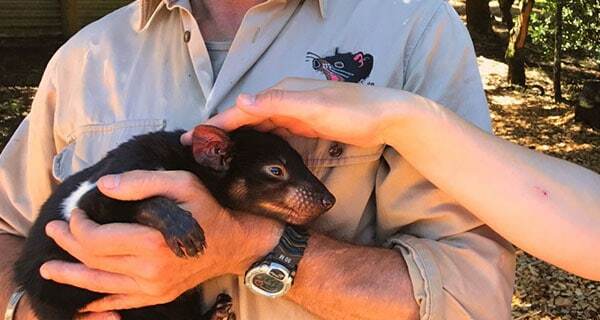 An experienced Tasmanian Devil Keeper will give you an accurate understanding of their lifecycles and the current threats that confront them, such as Devil Facial Tumour Disease. We consider this aspect of our work a valuable tool in the education of the general public, and an important part of our conservation efforts. Don’t miss your chance to visit Devils@Cradle … you’ll be pleased you did. Wander through the sanctuary at your leisure see the animal’s daylight habits, sleeping in their dens, sunbaking, play fighting or fossicking for food. General Entry: 9.30am – 5pm. (bookings recommended to avoid disappointment). One of our keepers will lead you through the sanctuary and provide you with a thorough insight into the operation of a working sanctuary such as this one, and explain the importance of various conservation programs that we are involved in for these three unique and threatened animals. The sanctuary comes alive in the evening! The After Dark Feeding Tour provides an unforgettable experience, seeing these extraordinary animals in ‘action’ each evening. Our experienced keeper will discuss biology, behaviour, threats and the important conservation work being undertaken for these species within the sanctuary. Devils are primarily a nocturnal species therefore far more active at night, we use environmentally sensitive lighting and focus on the social interactions and feeding habits of these unique carnivores, allowing visitors a rare up-close opportunity of seeing Tasmanian devils in a group feeding situation – quite a spectacular sight!  Do you want a unique and exclusive Tasmanian wildlife experience within Tasmania’s iconic wilderness….? 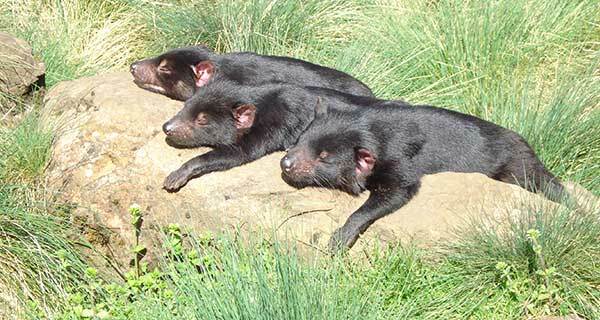 Then visit the island’s premier Tasmanian Devil Sanctuary, Devils@Cradle and ‘DINE WITH THE DEVIL’. 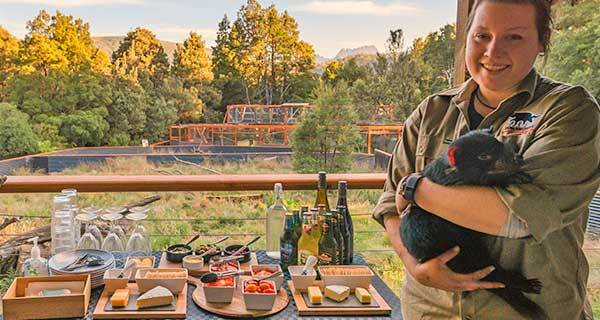 A small number of guests will have the unique opportunity for an exclusive evening visit to the sanctuary, where you will experience amazing animal encounters, enjoy delicious Tasmanian salmon, cheese, wine and beer whilst wandering through an ancient Cradle Mountain rainforest, home to the iconic and mysterious Tasmanian devil. 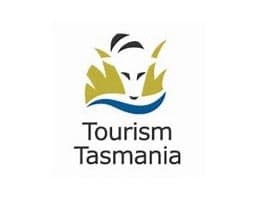 You will even get the opportunity to roast marshmallows around a campfire, to the sound of screaming Tasmanian devils, as the sun sets over Cradle Mountain. These small group tours allow us to go behind the scenes and meet some of the local residents up close and personal, along the way you will learn all about these amazing animals and our conservation work from one of our experienced animal keepers. Paid bookings are required in advance (no at the door sales). Tour time: 7.00pm – 8.00pm. Want to get up-close and personal with some of our young animals? The NEW Joey Encounter tour will take a small group of LUCKY visitors behind the scenes to our hand-rearing nursery, where you will interact (face to face) with some of our captive born joeys that are being raised by our sanctuary keepers. This is a unique opportunity and will be a very special and memorable experience, ideal for families with young children or animal lovers of any age. Operating at 12 noon this tour will incorporate; feeding the various joeys, conditioning/handling and general health checks by our keepers and the opportunity for you to pat and get photographs with these beautiful young animals. These hand-reared animals will remain at the sanctuary as species ambassadors and will become important breeding animals in the next year or two. 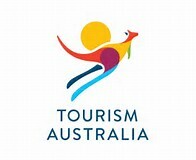 When joining this tour you will be directly supporting these animals and threatened species conservation. The admission for this tour also includes free entry to a Day Keeper tour, so after your Joey Encounter why not grab a lunch pack and join our 1.00pm Day Keeper tour to learn all about the operations of this unique alpine sanctuary. Every donation helps us effectively run our range of conservation programs which protect and support these unique animals.